We just wrapped up using cloth diapers with a newborn for the very first time. And I loved it. Seriously. 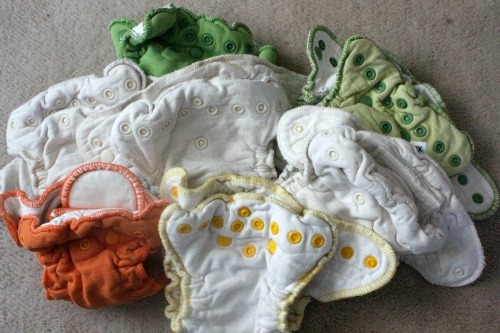 My dear friend, Autumn, loaned us a stash of beautiful cloth diapers for Jubilee. I was super excited about using cloth from the get go, but really didn’t get to start using it until she was five weeks old, since that is when she finally came home from the NICU (and I saw no need to transport diapers back and forth from the hospital nor risk them losing one or more). Why did I like using cloth with a newborn? We didn’t use any yuckies on Jubilee. Jubilee looked seriously cute with fluff on the bum. Wash routine was a snap. We created little trash (we did and do use disposable wipes). Which brands did we use and what did I think of each? We used EcoPosh, Good Mama, Muttagin Baby, Ragababe, Rumparooz (Little Joey), Sustainable Baby’ish, and Tangerine Baby. The only wrap I used was ProWrap. Ecoposh: Super absorbent, cotton, cute, easy to adjust and use, snapped on, turned seams at legs, three attached inserts, fitted diaper (requires a cover) . These were the second ones I always reached for if they were clean. 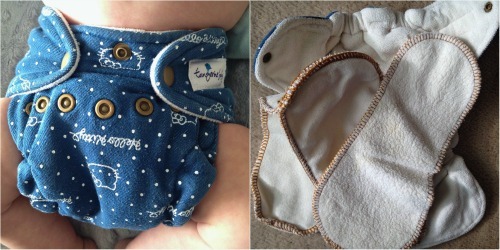 The only drawback for me is that the inserts can’t be removed, so these diapers can seem bulky. I didn’t find them bulky and we needed the layers for absorbing, so I loved them. I also liked that I couldn’t lose the inserts. 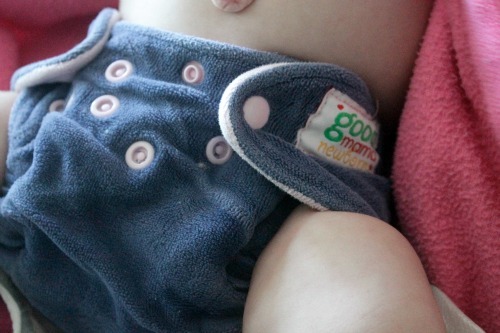 GoodMama: Really absorbent, cotton and bamboo velour, cute, easy to adjust and use, turned seams all around, snapped on, two unattached inserts, snapdown for umbilical cord, fitted diaper (requires a cover). These were in constant use here and I loved them. The colors are beautiful. The inserts can be arranged for what works best for your baby. They are super soft. Muttagin Baby: nicely absorbent, super cute, cotton, easy to adjust, serged seams, snaps, snap down for umbilical cord, fitted diaper (requires a cover), two snap in inserts. I loved these. I wish there had been more than three. Would use these again in a heartbeat. 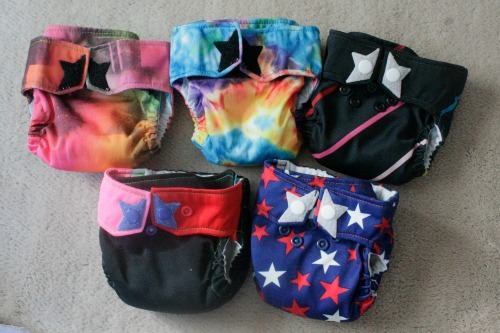 Ragababe: Not as absorbent as the others, wayyy cute, turned seams all around, bamboo rayon inner and laminated polyester PUL outer, easy to adjust and use, snaps and velcro, has cord snap down so the diaper doesn’t rub the umbilical cord as it heals, all in one diaper (does not need a cover). This brand had the cutest in the stash for me (I’m a sucker for tie dyed) and I expected to like them best, but they aren’t as absorbent and require an additional insert(s) to avoid over soaking and then leaking. I loved the trimness of the diaper though and adored these diapers for Paul Louis when he was a toddler. It’s my understanding that the all in ones for newborns are no longer being made. 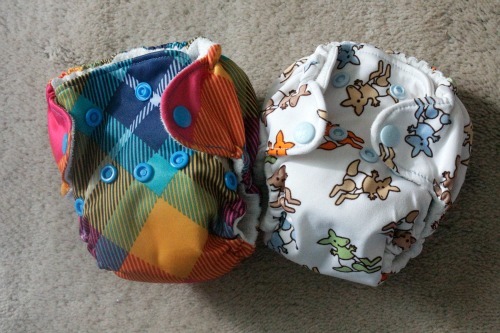 Rumparooz/Little Joeys: Somewhat absorbent, really cute, turned seams all around, easy to adjust and use, snapped on, has cord snap down, had gussets, all in one diaper (does not require a cover). I used Rumparooz One Size diapers with Paul Louis and they contained amazingly, but the newborn diapers weren’t absorbent enough for my taste. They often leaked. The gussets contain poo, but if the diaper shifts on the little tiny bum, urine can leak. I think it’s because these are a little stiff, meaning not quite as flexible or moldable to the baby as others. These leaked often enough that, after awhile, I reached for them only when everything else was dirty, which didn’t really happen. I liked these a lot when Paul Louis was cloth diapered. Sustainable Baby’ish: Really absorbent, easy to adjust and use, snapped on, serged seams, two attached inserts, snap down for umbilical cord, fitted diaper (requires a cover). I would call these a workhorse newborn diaper. Easy, take a beating, and keep working. The ones I had to use weren’t as cute as others, but they did the job perfectly and never leaked. Again, I liked that I couldn’t lose the inserts, but these aren’t as cushy soft as other diapers. Tangerine Baby: Absorbent, adorable, easy to adjust and use, snapped on, two unattached inserts, fitted diaper (requires a cover). I loved these diapers and have bought some one size ones for our new stash, but the newborn ones run really big and I couldn’t use them on Jubilee until she was about nine pounds. They fit her adorably now and she’s over ten pounds. These are made by a WAHM and I love that. They also come in adorable prints (Hello Kitty and flowers here). Super soft. Again, I liked that I could arrange the inserts for what worked best for Jubilee. 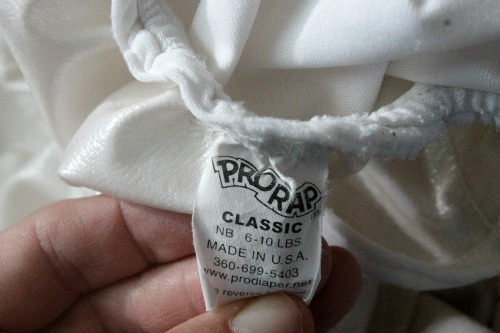 The ProRap lived up to its name. Seriously. Wow. Easy to use velcro wrap that never ever leaked. Easy to wash. They were amazing, even if they weren’t all that pretty (basic white). These are workhorse covers that are worth every penny because they do exactly that they are supposed to do: cover and contain. Which diapers did I like the best? Hands down, I liked the Good Mamas best. They were incredibly absorbent. Fit quickly. Easy to use. Never leaked. Were super soft. And looked adorable. After she could wear them, Tangerine Baby were my next favorite. I just love them. All of these brands can be bought in Facebook groups at used prices that can really help make a stash do-able. 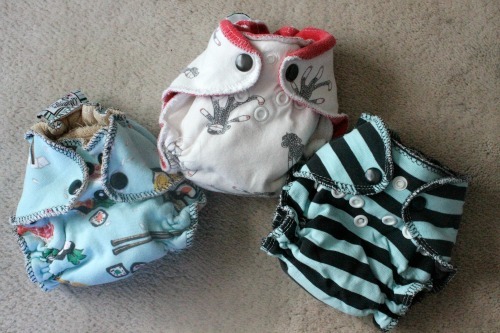 We now have built our own cloth diaper stash and I will share those down the road a bit. I’m figuring out what I like, what I don’t, and what I love. Within the budget I have. I can’t buy any diaper I want and just buy a ton of them. I have to work within my budget and then find what works for me as well as what works for Jubilee. 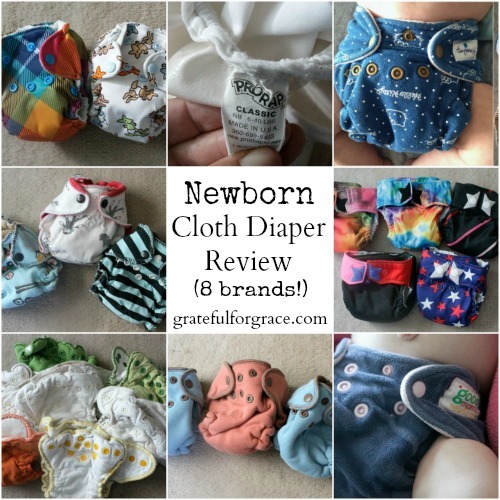 So, that’s my review of the newborn cloth diapers. 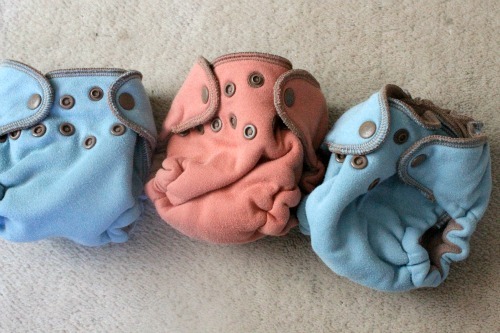 Have you used any of these cloth diapers? Did you use cloth with a newborn?